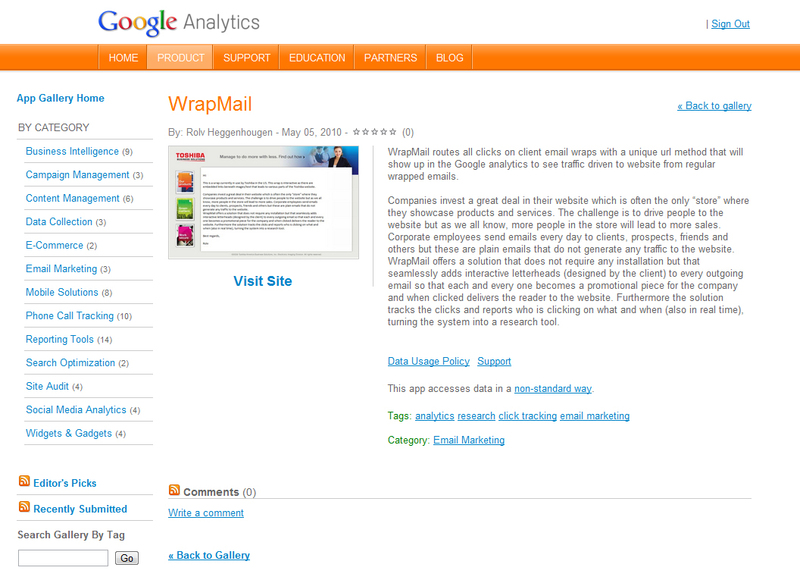 WrapMail has for long been listed in the Google Apps Marketplace with both the Business and Educational email marketing solution. Companies invest a great deal in their website which is often the only “store” where they showcase products and services. The challenge is to drive people to the website but as we all know, more people in the store will typically lead to more sales. Corporate employees send emails every day to clients, prospects, friends and others but these are plain emails that do not generate any traffic to the website. WrapMail offers a solution that does not require any installation but that seamlessly adds interactive letterheads (designed by the client) to every outgoing email so that each and every one becomes a promotional piece for the company and when clicked delivers the reader to the website. Furthermore the solution tracks the clicks and reports who is clicking on what and when (also in real time), turning the system into a research tool. This “hidden” advertising medium is probably the most viral available and the least costly, WrapMail only charges $5 per user per month (and a one-time signup charge of $150 which includes a custom wrap). Companies invest a great deal in their website which is often the only “store” where they showcase products and services. The challenge is to drive people to the website but as we all know, more people in the store will lead to more sales. Corporate employees send emails every day to clients, prospects, friends and others but these are plain emails that do not generate any traffic to the website. This “hidden” advertising medium is probably the most viral available and the least costly, WrapMail only charges $5 per user per month. Every Shop to Earn distributor has a unique website and, like all professionals, send emails every day to clients, prospects, friends and family. 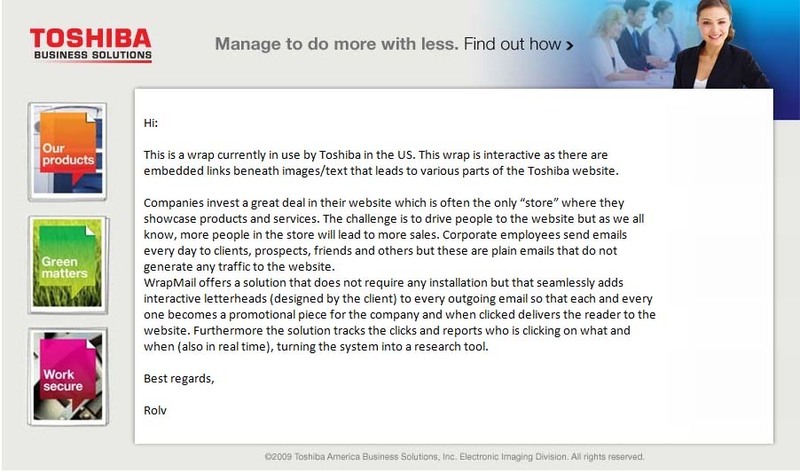 Using WrapMail’s solution will glue together their unique website with these daily emails. The effect is that every email they send anyway now becomes part of their marketing, driving traffic to their website and giving valuable research as recipients click on various parts of the wrap.